70 Min. & 90 Min. In 2010, the United States approved the first new nuclear power plant in 32 years, heralding a "Nuclear Renaissance". But that was before the Fukushima accident in Japan renewed a fierce public debate over the safety and viability of nuclear power. Based in part on Kelly McMasters' book "Welcome to Shirley", about growing up in the shadow of the Brookhaven National Lab on Long Island, the film explores the health consequences documented by people living in Shirley, as well as near other nuclear facilities. Their concerns call into question who can be trusted to provide truthful information, and how much influence the nuclear industry has over the Nuclear Regulatory Commission and its decisions. "In the wake of the Fukushima disaster in Japan,The Atomic States of America casts a timely inquiry into the viability of nuclear energy." "A stimulating, well-made piece. 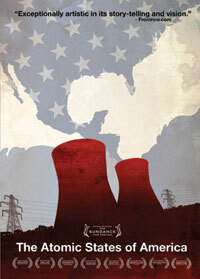 A sobering documentary about the dangers of nuclear reactors and a downsized Nuclear Regulatory Commission." "Reasoned and worth engaging... The film builds a convincing statistical case about cancer and nukes." "Potent, emotionally powerful, and highly revealing, ... does an outstanding job of opening our eyes to the reality of nuclear power. Acutely topical....The Atomic States of America convincingly encapsulates both the history of this allegedly clean source of energy and our collective denial of a potentially looming disaster at our aging sites." "Exceptionally artistic in its storytelling and vision."